Add a colorful, fact-filled periodic table to your students’ science binders. This 2-sided chart is 3-hole punched and laminated to provide a durable, reliable reference. 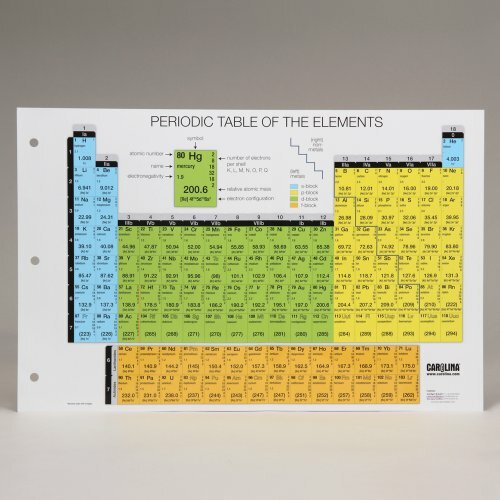 The front of the chart folds out to 11 × 16-1/2″ and includes each element’s name, atomic number, symbol, number of electrons per shell, electronegativity, relative atomic mass, and electron configuration. The back of the chart features a vivid, real-world image of each element plus the density, melting and boiling points, and rounded atomic mass along with a key to determine whether the element exists in solid, liquid, or gaseous form. Includes elements through 118.